My goodness, this looks delicious! Can't wait to try it. It was great! If you do make it, I'd like to know how yours turned out. I wonder if it is sold only in New England or if it is around the country. Irish butter - perfect!! 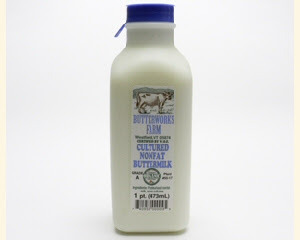 I can only find local buttermilk at specialty stores but there is a difference. And oh, the tanginess of buttermilk blueberry muffins! I can just about taste yours from looking at the picture. It really is great stuff! And the thought of your vegetable soup is making my mouth water! We have the soup quite often. It is delicious and more filling than you might expect. I'm on Pinterest!! :<) Hope it turns out well for you. I'm going to try your buttermilk pancakes sometime!! Oh, oh, oh ... this looks so good! I'm going to make the recipe soon! Deirdre P.S. Have to go look up or find the piece of paper with my google password, so, I'm "anonymous" today but you know it's the same Deirdre!! Thanks. There are a couple other recipes on deck. My mom used to like buttermilk a lot, too. This cornbread looks wonderful and sounds delicious with vegetable soup. I still have my original very well used Moosewood Cookbook from my college days. I haven't used it for a while but I think I will pull it out this weekend. Thanks for the recipe and the reminder. I gave up my old Moosewood Cookbook, but cut out the pages of the recipes I made. Honestly as much as I loved it, and the idea of it, the recipes were not easy to follow. I don't know if this recipe was in there or not. I did a search for cornmeal, buttermilk, blueberries and Mollie's page came up with this recipe. I've missed your recipes! I'm tempted by this but I'm supposed to be eating sensibly, and I have no restraint with things like this. Could it be made is small tins, like muffins, and then frozen,so you could pull out one at a time to eat? I'm sure you could make muffins. But blueberries are very sensible! I love quick breads and this one looks yummy. I have my original Moosewood Cookbook standing next to my original Laurel's Kitchen--that dates me right there. Not sure I have any local options on buttermilk, though. Oh, I do love Laurel's Kitchen. I loved the philosophy of it, and wanted to live in that way. Buttermilk means soda bread to me, it is hard to get round here though. That so surprises me. I would think there would be local dairies that would make it. I love soda bread, and have posted a couple recipes here. I need to make some, and soon! How could these not be heavenly? I can't wait to try them! We always have buttermilk in the house, too. I use it for Rod's Buttermilk Pancakes, Oatmeal Pancakes and a Trisha Yearwood salad dressing. This recipe sounds like one I'll have to add to my collection. I love, love, love blueberries! We are still eating the blueberries bought from our neighbor who grows them. We have them most mornings in yogurt. Yum. Thanks. I love what you wrote! Oh, yum! 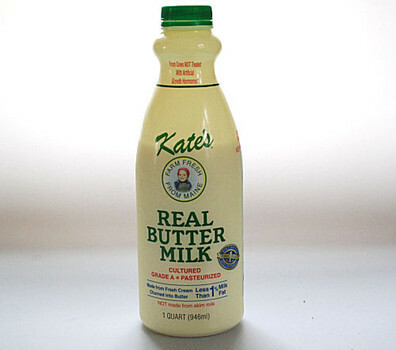 I have buttermilk in the fridge as I use it for my Irish soda bread. May have just enough to try these. And I need to make some soda bread. It's been too long. The recipe looks interesting but what caught my eye was the celebratory notice for Barbara Pym. Are you a fan of hers? I've just read her book 'Some Tame Gazelle' - her first I believe. I enjoyed it very much. I read it because I am such a fan of Miss Read and Miss Read was herself a fan of Barbara Pym. Since I worked for the Church for 5 years I can identify with the lives of the clergy somewhat and found Barbara's take on it very interesting. I intend to read more of her work. I am currently reading 'Glittering Images' by Susan Howatch. It is the first book in the Starbridge series. Are you familiar with those? If not, may I suggest you give the series a try. I didn't know that Miss Read was a fan. I love hearing things like this. I will look into the SH book. I haven't read her. Thanks so much. That sounds soooo good and not too much sugar which is great for us. I came by because I knew I'd missed a post or two. And was transfixed by the view out your window, through the beautiful vase of tulips! What a wonderful header shot. Gosh I missed you while you were gone! And thanks about the picture too. Hey Nan! You know I checked back here from time to time this winter, wondering if you had decided to step back into your blog. Nope. You were on my mind again today (the book is in the mail - should be there Monday) so I swung back around just to see one more time. Lo and Behold! So, welcome back. I have read through your March posts and am leaving a comment on this one because I thought you might be interested to know that Jack Lazor and family of Butterworks Farm in Westfield have been renting our farmland for years and their Brown Swiss cows eat organic corn grown on our place. So, if you've been using the cream ... another little connection. Martha Stewart featured it on her show some years ago. It's the good stuff. Welcome back! Joyeux Paques! Isn't that just wonderful!! Thank you for telling me. I love it. And thanks for the welcome!